Broken Walls was conceived in 1995 by (a Mohawk from Tyendinaga Territory in Ontario, Canada) while attending a conference called the Sacred Assembly in Ottawa/Hull. 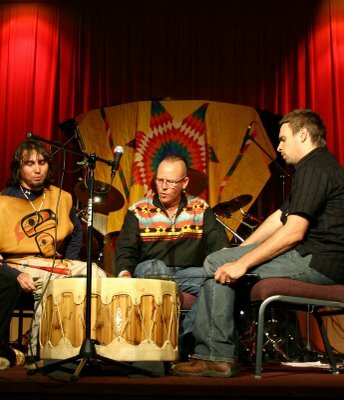 As different First Nations speakers shared, they spoke of the walls that have been built between the visitors to this land and the First Nations people, Jonathan began to see the need for these walls to be broken and wrote the song “Broken Walls” on the spot and performed it on the drum at this Gathering. Broken Walls now consists of Bill Pagaran (Tlingit) from Pal mer, Alaska on the drums,Kris DeLorenzi (Italian) from Thunder Bay, Ontario on bass and backup vocals, and Jonathan Maracle (Mohawk) lead vocalist and guitarist. Broken Walls base many of their songs on the ancient sounds of the First Nations People of North America and often perform around their large Pow Wow drum, singing songs of and to the Creator. The band has a team of First Nations Dancers that often accompany them in full regalia when they perform. Broken Walls travels year round and has toured worldwide over the past 10 years performing in places such as Peru, Mexico, China, Hawaii, France, Germany, Switzerland, Australia, Israel, Costa Rica, and extensively across North America. They have taken the healing quality of their music into many places where restoration and reconciliation were needed, with great results. Broken Walls has released 8 albums to date. Their latest CD, “The Father’s Dance”, released January 2008, is an inspiring musical journey and a call to freedom. This full band world music album has a distinctively Native American sound and beautifully unites traditional aboriginal sounds of rattles, Pow Wow drum, and Mohawk wind flute together with a blend of contemporary instruments. “The Father’s Dance” presents powerful songs with a message of restoration for the family, meant to stir the heart to dance in the presence of our Creator.